Salting the roads in the winter has become a necessary evil. Rock salt is the cheapest and most effective way to lower the freezing temperature of water, de-icing roads and sidewalks for cars and pedestrians. According to the Federal Highway Administration, winter road maintenance uses 20% of department transportation maintenance budgets nationally. On top of that, state and local agencies spend more than $2.3 billion on snow and ice control operations annually. Rock salt first debuted in New Hampshire in the 1940s because of the expansion of highways and the need for clear driving conditions. Nearly 22 million tons of rock salt are dispersed throughout the U.S. yearly, that equates to about 137 pounds of salt for every American. During the 2016-2017 winter season, The Pennsylvania Department of Transportation used 9.8 million gallons of salt brine and 900,000 tons of salt to keep the roads clear. This amount adds up and finds a way to our rivers, lakes, and streams. Over the years, the effects of rock salt on our water bodies has become more evident, prompting scientists to come up with more efficient salting techniques. Some state agencies have begun to use special equipment to spread the salt more efficiently as well as implementing salt mixtures with additives such as beet juice, molasses, and brines to help the salt stick to the road better. Alternative options to road salt are often more expensive and also pose their own set of environmental concerns. 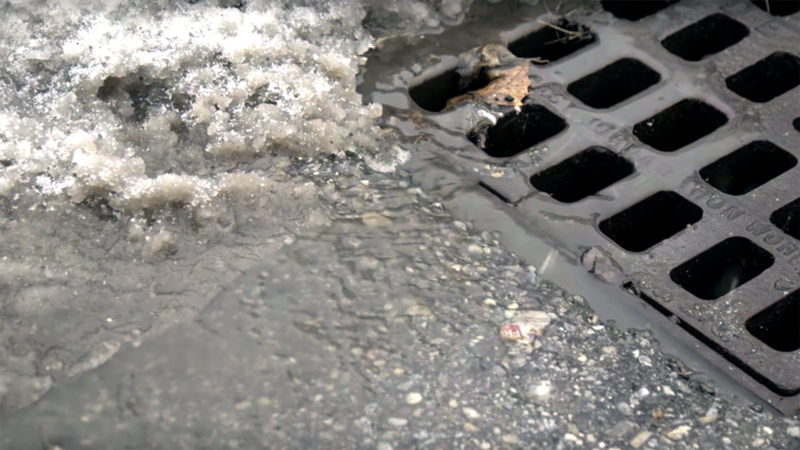 Road salt makes its way into the storm drains. Photo by Great Lakes Now. In 2004, Canada listed salt as a toxin to be managed by the government because of the harmful impact it can have on ecosystems. Salt corrosion causes billions of dollars in damage each year to cars and infrastructure, as well as the accumulating environmental impacts. In the past 50 years, chloride concentrations in some lakes and rivers have quadrupled, reducing the number of animals and plants and killing off diversity. In some studies, high salt concentrations have even reduced reproduction rates for aquatic organisms and impacted the survival rates of these species. High salt concentrations can also reduce water circulation in lakes and ponds which prevents the necessary flow of oxygen through the water. For humans, salty runoff can impact water consumption as the water enters source water that we use for drinking. Water utilities most often get complaints of salty drinking water in the winter, when the chloride concentrations are most likely to exceed 250 ppm, our tongue's threshold to detect the compound. The trees and plants next to roadways can also be affected as well when they become dehydrated from the salt. Despite all of the drawbacks, road salt reduces crashes by up to 88% and injuries by up to 85%. Some scientists even argue that the increased alkalinity waterways make it easier for freshwater mussels and clams to build their shells. As for now, the negative effects of salting our roads in the winter will have to continue until we develop more efficient techniques or determine an effective alternative.